Like any kid, I was pretty enamored with McDonalds french fries. For little me and my little hands, they were like golden, salty, magic wands, able to appease even the worst of my temper tantrums and toddler breakdowns. Because my mom loved me, and wanted me to eat anything that resembled a vegetable, sometimes she cooked fries at home. Even with her best intentions, the freezer-burnt-flavoured undertones coupled with the unmistakable tinge of plastic bag shone through, and the texture was never right – damp and flaccid. Sickatating. There was just no foolin’ me. This was not Mickey D’s. Years later, I still like a good fry. There’s a chip truck on the road to my cottage in Canada that my dad stops at from time to time and truth be told, I stick my eager fingers into that grease-soaked cardboard container for a few golden crispy bits (the ones at the bottom are the best, am I right?). Yes, I always feel sick after, but it’s a healthy reminder of why I don’t eat like that every day…and sometimes it’s good to be bad, am I right? This weekend, I just had a fry hankering. I remembered an incident at work last winter when I made a huge portion of parsley root fries to actually serve to customers, but they were so good I ‘accidentally’ ate them. All of them. Before they made it on to anyone’s plate. Oops. Amazing I still have a job. But the thing I took from that experience other than being extremely full, was that parsley roots make for some darn fine fries. Who knew? Everyone knows parsley – it’s the brighten-things-up, light + leafy go-to herb. But did you know that there’s something delicious lurking underneath that bushy bunch of greens? It’s the root, and by golly you can eat that part too. Although not as common as other root veggies, parsley root is extremely delicious. 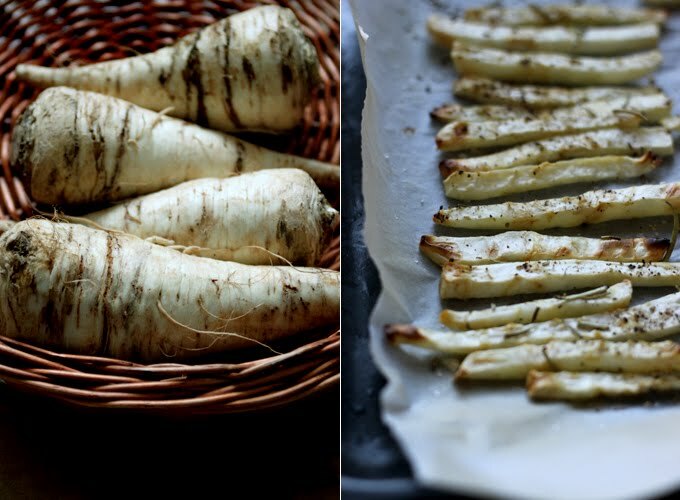 Its doppelganger is undoubtedly the parsnip and I am often fooled at the market even when they are side by side. If you’re a first-timer with this veggie, make sure to read the label because they seriously look almost identical. The flavour of parsley root is kind of like an herb-y potato, which is why it makes such a lovely fry indeed. Somewhat less waxy than a potato however and with a higher water content, it will not get completely crispy in the oven, but certainly good and golden crunchy tips. In terms of the health benefits, parsley root has been used for centuries to ease digestion, detoxify the body, and tonify the lungs and spleen. It is also helpful for those of you who are dieting (or cleansing!) after the holidays, as it has strong diuretic properties. Parsley is beneficial for urinary tract disorders, stones in the kidneys and bladder, nephritis, as well as for the adrenal and thyroid glands. And again, nature provides us with what we need at just the right time of year: parsley root is an excellent blood-building food that is also warming to combat the winter chills – no coincidence there. Key nutrients in parsley root include vitamin A, E, C, calcium, iron, potassium, phosphorous, and magnesium. Pregnant women should be cautious with parsley (most specifically the leaves) as they contain an essential oil, apiole, which can cause uterine contractions. And what’s with the ketchup you ask? I guess I just couldn’t go and make fries to eat with a store-bought sauce – I am a food snob after all. But seeing as tomatoes are anything but at their peak, I thought roasting them would be the perfect solution to bring out the sweetness with a touch smoky. Of course you can skip this whole sauce business, but if you’ve never made ketchup before, you’ll be surprised at how simple it is. I got fancy with some interesting flavours, like star anise and balsamic vinegar, but you can leave these out if you’re a purist. It’s best to roast the tomatoes while you prepare the parsley roots. If you cook them all at the same time, there is too much moisture in the oven and the fries will get a little soggy. 1. Preheat oven to 375°F / 190°C. 2. Wash and cut tomatoes in half. Place on a lined baking sheet. Lightly drizzle with oil and a pinch of sea salt. 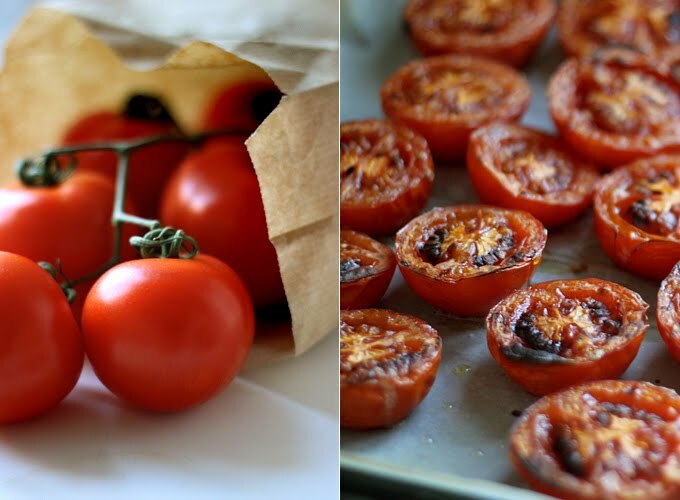 Place in oven and roast for 30 minutes or so, until tomatoes are caramelized and fragrant. 3. While the tomatoes are cooking, heat some oil in a large pot and add onions, a pinch of sea salt, black pepper, garlic, chili flakes, star anise, bay leaves, and coriander. Cook until the onions soften slightly, about 5 minutes. When the bottom of the pot gets dry, “deglaze” the pot with balsamic vinegar. 5. Add back the star anise and bay leaves, bring a boil, reduce to simmer, and cook until thickened (5-10 minutes). Season to taste. If it is not tangy enough, add a few teaspoons of apple cider vinegar. 6. Once the ketchup has slightly cooled, pour into a clean glass container and store in the fridge for a week. Freezes well. 2. Peel roots and cut them into french-fry sized sticks. The thinner, the crispier they will be. Toss with some oil, a few pinches of salt, pepper, and fresh rosemary if desired. 3. Roast for 20 minutes, toss, and place back in the oven for another 5-10 minutes until golden on the edges with crispy ends and a tender center. Serve immediately with Roasted Tomato Ketchup. If you’re still cleansing (way to go!!! ), this recipe would be totally appropriate to make, but I would replace the balsamic vinegar in the ketchup with apple cider vinegar. I hope you’re all sticking to the plan and feeling good. I am still loving the feedback from all of you participating so keep it up! I feel like we’re creating an army of healthy people – it’s awesome. source: Balch, Phyllis A. Prescription for Dietary Wellness. New York, NY: Penguin, 2003.
you can hardly call them “fries” since they are baked in an oven! Wonder if these parsley root strips can truly be fried in hot oil? That’s the only way to go for me. flavor was INTENSE . Very Good !! I tried it with parsnips. Delish! Looks very delicious! I love these! Sarah- What high-heat oil didyou use to roast the fries and tomatoes? I am just curious… was thinking maybe grapeseed oil, but what did you use? Made Celery Root fries today in Asheville, NC. They were wonderful! Thank you for the recipe! Great idea! Root veggies are in season here in Québec, too. I have a crisper and pantry full of potatoes, parsley, carrots & rhutabegas. Hubby likes homemade potato fries, so might have to try a mixed vegetable batch next. Another incredible recipe – I made these tonight to go with my kale and hummus wraps and they were divine. Thanks for sharing! hehe:-) this has been a big discover-the-white-roots-adventure for me! because I had first purchased….hmmm…parsnip instead of parsley roots(incredible how similar they look, so hey I had a good laugh coming home and seeing another name on the box in my hands) 🙂 so I made a soup, few days later I managed to get the real stuff! btw my coolest memory from my childhood is waiting my grandma to serve the hot (+greasy) frites made out of the first potatoes of the year (the ones you may cook with their thin skin)…yumyum! THANKS a MILLION for spoiling us with you great recipes-we love them and love U!!! It’s so great to hear that you are feeling amazing on the cleanse! Way to go! I’ve been doing the detox diet for the last three weeks –I feel so good about the food I’ve been eating! Thank you for creating such wonderful recipes for the first week. I’ve even made some of them multiple times and I’m pretty sure I’ll continue making them for a long time. 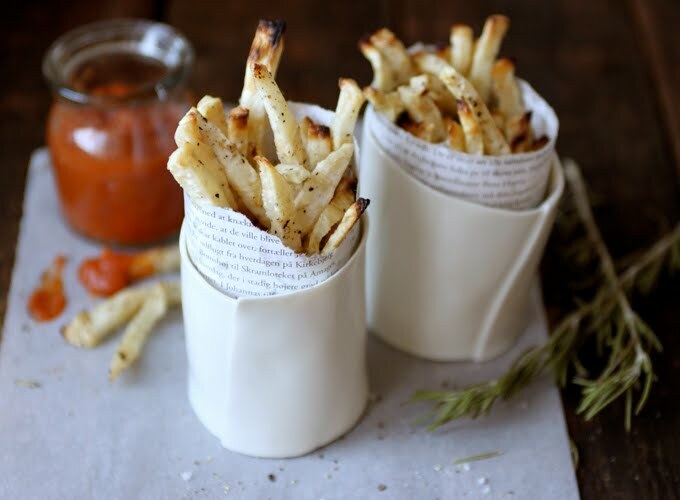 Today is the first day of Week 4 in the plan for me and I’m making these fries with parsnips tonight. I’ve never had parsley root, though. Thanks again for sharing your wonderful recipes! These look delicious!!! I am going to school in the fall to become a holistic nutritionist. Your blog is such an inspiration to me! We totally made these with both the parsnip and the parsley root. Both incredible but parsnip was a real winner! Thanks for the amazing recipe! We had those with bean burgers. So good! aaah! i cannot tell you how delighted i am to have discovered this blog! i’m so excited to dig through all the archives!! ah, thanks for the idea. bought a bunch of parsnips today at our farmer’s market here in New York City; my default is usually roasted, or as soup but this gives me an alternate idea to play with. Delicious, thank you for the idea and inviting photography. I’m enjoying your recipes and natural knowledge very much. Yumm I’ve never made my own ketchup before but now I want to! Fantastic recipe! I love finding healthy food that satisfies the “every now and then” desire for something a little less healthy. Always so helpful and educational when you explain the health benefits/properties right with the recipe. oh yummy~ it looks so easy as well. i hope the repairman comes to fix my oven soon. Great recipe idea, thank you Sarah for supplying us with so much love and healthy + tasty recipes! No parsley roots in my grocery store though so I bought parsnips instead, as recommended. The fries turned out golden, crispy and full of lovely rooty sweet flavours! Made this tonight, with carrot, celeriac, parsleyroot and something we call “pastinaak” over here (I love parsleyroot as well and had just bought a bunch of them this weekend). Heard a lot of “delicious from everybody!!! Made a delicious dressing with mayo, yoghurt, lemon, koriander (fresh) and oliveoil (because we eat our fries with mayo over here -Holland-, see Pulp Fiction). Hi Anon I – parsley root would most likely be on the high end of the GI, along with parsnips and carrots. WOW so original, really love this. What a cool idea. The ketchup sounds great, too. This is the first I’ve heard of this root vegetable! Looks like you put some good use to it! I love making my own ketchup. The store bought ketchup cannot be good for you with all the preservatives! Yours looks like a great version – I’ll have to give it a shot! This looks wonderful. I don’t even like potato fries, but these looks like something i would just love, thank you for sharing the recipe ! 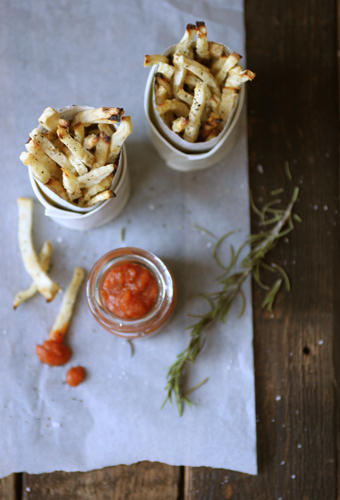 yay – a healthy version of fries & ketchup! i LOOVE roasted winter vegetables – and luckily i don’t have a problem finding parsley roots here in germany. but – they do taste special, so i guess one could substitute with parsnips? Just want to say THANK YOU, thank you, thank you:) I love everything about your blog and your delicious recipes. And lucky for me, parsley roots are sold everywhere in Denmark. Gotta try this too! I ALWAYS go to your recipes when introducing family members to my wild and healthy ways. Root veg mulligatawny, the raw brownie, this is SO next on my hit list. Thank you for being you and making the things you make. I’ve never heard of parsley root! Who knew there was something lurking beneath! Looks delicious though!!! *Oops, so sorry! I didn’t see that in #6 there for some reason… question answered! This looks amazing! I have to try this, especially the ketchup. How long will the ketchup keep for? Still on the WL action plan, although I cheated just a little on the weekend, lol, but I still feel much better eating healthier foods in general and skipping the caffeine. I think I want to continue this adventure using recipes from your blog and WL. So inspiring! These look incredibly amazing! I can’t wait to hit up the market tomorrow and give these a try! Thank you! I recently notice some parsley root in the grocery store and just didn’t know what to do with it. I’m glad you wrote this post because now I can buy them without fear! This looks mighty tasty. Glad to find your beautiful blog, through Lisa at A Bloomsbury Life. I, too, love a good fry. I must keep an eye out for this delicious parsley root! Roasted root vegetables with golden crunchy tips = my favorite winter food! I am going to go on the hunt for some parsley root for this – I love experimenting with new veggies! Hi there 🙂 Beautiful blog! These fries and the ketchup looks really perfect! If only I can find parsley roots!!!! Never ever heard of this root, you are always such a source of great ideas! Thanks for sharing this, I’ll surely make it!